I am also appalled watching radical Federal judges with lifetime appointments, Federal, State, and City officials use political correctness to supersede the rule of law in furtherance of personal agendas. This unlawful conduct militates against America's best interests and is in blatant violation of their sworn oaths to uphold the U.S. Constitution. Catalyzing America's Descent: America's greatness, traditions, culture and values dramatically descended during Obama's eight disastrous years as president because of the ethos he established. Among other things, he is the only U.S. President to consistently trash the Constitution; disparage and apologize for America's greatness to the international community, particularly to his tyrannical dictator pals with whom he shares a common animus towards the U.S.; and intentionally inflame the ugly fires of racial division. Ultimately, an individual's true character does not change and Obama certainly brought his to the White House. This was made abundantly clear by his words and actions that evinced a deep rooted hatred of America, Whites, the military, and law enforcement. 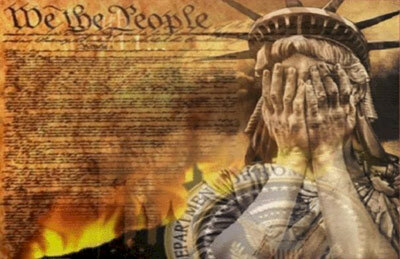 America's Real Danger: There is another rarely mentioned yet ubiquitous group that is as culpable in facilitating America's fall from greatness and far more dangerous to her viability as a strong nation in the future. They are described in the following quote regarding Obama, but relevant nonetheless, that has been attributed to different people, yet regardless of attribution, it is spot on and should be taken very seriously. "The danger to America is not Obama but a citizenry capable of entrusting a man like him with the presidency. It will be far easier to limit and undo the follies of Obama's presidency than to restore the necessary common sense and good judgment to a depraved electorate willing to have such a man for their president. This problem is much deeper and far more serious than Obama, who is a mere symptom of what ails America. Blaming the prince of the fools should not blind anyone to the vast confederacy of fools that made him their prince. The republic can survive an Obama, who is, after all, merely a fool. It is less likely to survive a multitude of fools such as those who made him their president". Fundamental Transformation of America: The core of Obama's presidential campaign was to fundamentally transform America, and he eagerly embarked on that ambitious mission upon taking office in January 2009. During his tenure astute observant Americans learned that fundamental transformation actually meant destroying our long standing traditions, culture, and values, as well as virtually disarming the military and law enforcement which were anathema to him. Obama was not alone in his endeavor. In addition to department heads and administrative grunts, he enjoyed strong bipartisan support from ranking and low level congressional sycophants, activist federal judges, laymen, and the omnipresent MSM. Not surprisingly, every key department head during Obama's presidency exemplified the old adage, 'one hires in their own stead', as each was a proven corrupt inveterate liar seeking fundamental change in America. This 'A List' includes the following gems: Holder; Lynch; Clinton; Johnson; Clapper; Brennan; Comey; Lerner; Koskinen; traitor Kerry. America's Open Borders: Perhaps one of the most egregious Constitutional violation was illegal immigration wherein America's borders and welfare coffers were opened to hordes of the world's non-white tribal indigents, primarily Muslims and Hispanics with cultures totally different from ours. Background and health screening for this stellar group was generally ignored to facilitate their immediate unfettered admission to America and access to her munificent welfare system. As an aside, House Speaker Paul Ryan was Obama's chief advocate for importing and supporting aliens of this ilk. He continues leading the charge for open borders, blanket amnesty, and welfare for all illegal aliens including DACA recipients. Ryan has dissed and tried to subvert Trump at every opportunity, including the failure to deter or stop Mueller's endless witch hunt. My blog on him, Paul Ryan, The Most Treacherous Snake in Congress, is very telling and worth a read. DACA (Deferred Action for Childhood Arrivals): This is Obama's illegal amnesty program created by Executive Order in December, 2012. It provides people ages 15 - 32 illegally brought to America by their parents, i.e., Dreamers, the right to apply for the temporary right to live, study and work in the U.S. while staying deportation for two years, and is renewable. There are approximately 800,000 Dreamers in the U. S. primarily from Mexico. They are not infants and young children as misrepresented by DACA proponents. It is abundantly clear that DACA is unconstitutional on its face: Dreamers are illegal; threaten American jobs and culture, and should be deported, the humanitarian aspect notwithstanding. Ramifications of Illegal Immigration: Obama's illegal immigration was not inspired by altruism, but rather his disdain for America and Whites, and likely to avenge slavery. Specifically, he intended it to sow the seeds of America's cultural and demographic genocide by flooding her with an endless stream of indigent non-White aliens who failed to add any value to our country and would vote Democratic. Obama knew their population would swell exponentially through rampant procreation and endless chain migration of relatives. It is crystal clear that this magnitude of population explosion will eventually operate to breed out or significantly reduce the White race and eliminate America's traditions, culture, and values. As quants say, 'it's all in the numbers'. Doubters need only observe the destruction of Western European traditions and cultures by scores of invading indigent tribal Muslim aliens demanding that they be supplanted with their Islamic ideology and sharia law. Trashing the U. S. Constitution: The Constitution is the law of the land. It established the Executive, Legislative, and Judicial branches of government to ensure a separation of the specific powers exclusively vested in each. Members of each branch are expected to comply with the law by working within this Constitutional framework and traditionally did so prior to the Obama era. Sanctuary Cities: Officials in these cities arrogantly refuse to enforce immigration laws. Instead, they blatantly violate the law by providing safe harbor and financial support to any illegal alien seeking to avoid arrest and deportation. Today there are more than 600 such cities supporting such trash, gratis the American taxpayer. Chaos, Systemic Disruption, and Violence: This is Obama's forte - his real area of expertise and the norm for protests involving race during his era. Professionally organized chaotic protests were conducted against law enforcement and city officials when police officers legally killed a black thug in the line of duty. This form of protest reached a crescendo and set the model in Ferguson MO: Obama and Holder met with organizers and emboldened their useful protesting thugs to incite violence and property destruction by stoking the fires of racial hatred. It was subsequently replicated in other cities under similar circumstances. The same ilk targeted Trump's rallies in an effort to stifle free speech through systemic disruption, violence, and intimidation. Racist, anti-American BLM thugs that Obama extolled and encouraged were consistently at the forefront of these violent riots, euphemistically called protests, and acted with virtual impunity. Rioters knew that demoralized cops would be passive or stand down because of the DOJ's ever present threat of indicting them for civil rights violations. Funding and Supporting Terrorism: Another of Obama's reprehensible acts was giving his Iranian terrorist pals approximately $33B between 2014 and 2016. Much of this most likely went into their nuclear program which he facilitated under the Iranian Nuke deal. Obama supported Hamas, Muslim Brotherhood, and the PLO while maintaining close relations with the dictators of these terrorist organizations. The icing on the cake of radical Islamic terrorism and Islamic jihad was Obama's consistent position vigorously denying their existence and forbidding his administration to use the terms. America Today: Trump has displayed remarkable resilience. He is doing an incredible job endeavoring to make America great again under the most adverse circumstances and obstructionism ever faced by a President in U. S. history. However, too many deep rooted manifestations of the Obama era ethos adversely affecting America remain, including the following, and must be changed for the betterment of our country and families. Churlish Obama Never Disappoints: Historically, Presidents left office and explored other opportunities or simply enjoyed the relaxation of retirement. Obama, however, irate that Clinton could not carry out his legacy, chose to continue fundamentally transforming America as a private citizen. He rounded up his cronies, e.g., Valerie Jarrett, and set up a shadow government in DC to continue subverting Trump and by extension, our country. Learn more at 'Obama's War Against Trump'. Wake Up America: Demand a Constitutional amendment limiting terms for Federal Judges and Congress; Demand an end to Mueller's endless expensive political witch hunt; Call on Trump to get real about draining the swamp by having noted career politicians who have committed major felonies thoroughly investigated and indicted beginning with corrupt liars Obama, Clinton and Comey. Excellent article! Really hits home! Can’t let these ppl who have this chip on their shoulder use their power to destroy our America just for their own satisfaction & to create chaos. Globalism is a one way ticket to our destruction. The saddest day was when 44 was elected because it set him up for free reign to devide the American People. All he needed was his flock and the ppl who voted for him got suckered in. He abused his powers and as a result- look at the state of this great country. Excellent blog! Anyone who loves America needs to read this!